Red Wine Glass Votive Candle Holder. NOVA68 Hand Blown Clear Wine Glass with Candle Votive Holder. Price is for 1 (one) wine glass as pictured. Special: $29.99 instead of $36.95. Looking for a unique wine gift idea or inspiration for unique gift ideas? Need Red Wine Glasses? 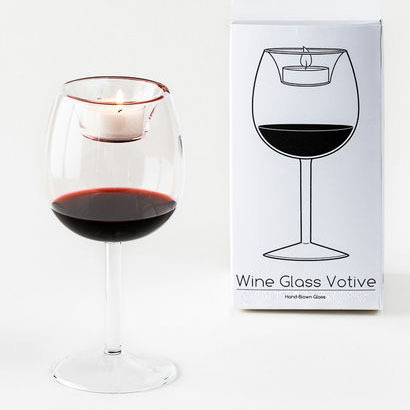 Our amazing 'Red Wine Glass Votive Holder' is hand-crafted from real glass exactly like any standard red-wine glass but features imitation red-wine & a small holder for candle votives. The look-a-like red wine is completely sealed inside the glass, each crafted with specially shaped glass that enhances the beauty of the imitation red wine that is enclosed. Display year round for a unique and highly decorative accent on the table or anywhere. Designed specifically to enhance the table setting while displaying the warm tone of red wines; these classic red wine votive glasses look elegant and decorative. Each elegantly shaped wine glass votive holder is handcrafted by highly skilled glass artisans. Everyday display piece with a classic red wine glass profile, beautifully crafted from top to bottom. Makes a great gift for anyone! Boxed as shows; makes a stylish gift idea.